Floridsdorf Allergy Centre (FAZ), Franz-Jonas-Platz 8/6, A-1210 Vienna, Austria;. Glatiramer acetate (Copaxone, Teva Pharma) and interferon beta are the two only disease-modifying therapies for multiple sclerosis. 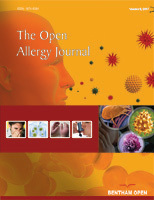 Glatiramer acetate is known for frequently simulating mild, anaphylactoid reactions while true, IgEmediated allergic reactions have been hardly reported so far. Herein, we report two females suffering from multiple sclerosis who experienced rapidly aggravating hypersensitivity-reactions upon treatment with glatiramer acetate. Patient one experienced an asthma attack, patient two an exacerbation of her urticaria and angioedema. An IgE-mediated mechanism could be demonstrated by a positive intradermal test to a 1:1000 dilution in the first 31-year old and by a positive skin prick test to a 1:10 diluted skin prick test in the second 32-year old second woman.